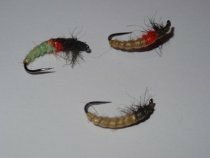 The essential and original material for tying Czech nymphs like the one pictured. It is a soft, flexible latex style body material with one side opaque and the other one glossy. 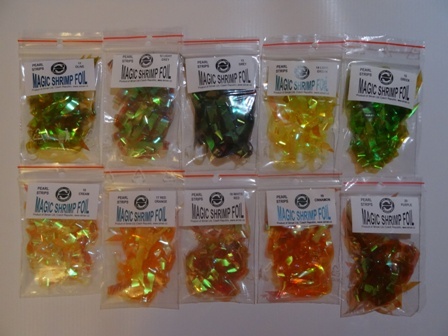 It has excellent additional uses as a material for shrimp backs, thorax cases and translucent fly bodies. It can be cut into any shape and wound onto the bodies of nymphs, buzzers, spinners etc. 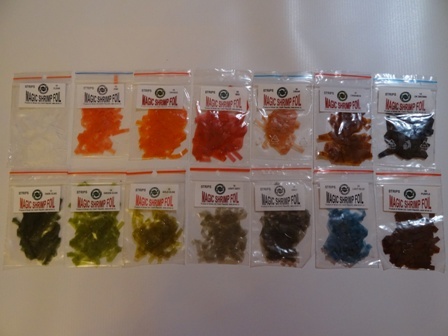 Magic shrimp strips are an essential for the creative river fly pattern tier. Strips' width: 4-5 mm. 1 bag gives 100 -120 flies. Cost only £2.50 per bag. Please select a colour from the drop-down menus. 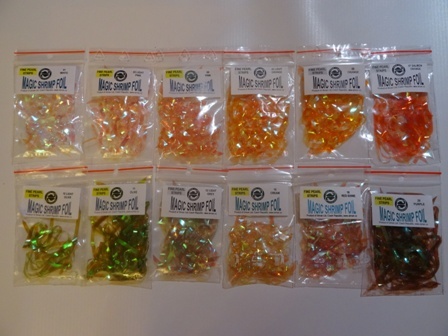 Magic Shrimp Foil in pearl translucent colours, perfect for flash back patterns like the Onstream-Guide flash back caddis shown on the right. 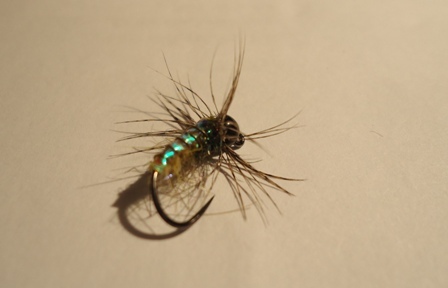 Also a good variation for tying Czech Nymph and shrimp fly patterns. This material adds a level of flash to these patterns that up until now was impossible to create. The pearl strips do not stretch like the original material but it does form to the hook just the same. A very easy to use material with a superb effect. Width: standard - 5 mm (3/16") wide strips. Cost only £2.50 per bag. 1 bag gives about 120 flies. 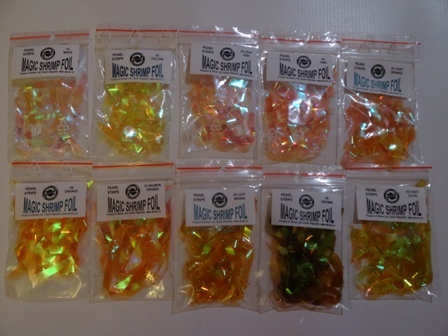 Smaller strips of Magic Shrimp Foil in pearl translucent colours, for smaller hook sizes. Great for flashback nymphs and shrimp style patterns. Great material with superb flash. 1 bag gives about 120 flies. Width: fine 3 mm (2/16") strips. Cost only £2.50 per bag. Choose a colour from the drop-down menus.